Many state leaders increasingly see competency-based pathways (CBP) as a valuable approach to ensuring all students have the time and support they need to reach college- and career-ready expectations. Achieve works to support such states in high-quality adoption and implementation of policy and practice to advance CBP toward CCR for all students. In 2012, Achieve formed a working group of leaders from several states and national and state organizations to develop a state policy framework for graduation requirements, assessments and accountability, explore equity considerations, and develop performance indicators that support a competency-based learning environment. Following that working group, Achieve launched a CBP State Partnership, providing targeted policy, implementation, and communications support to 12 states using CBP to advance college and career readiness for all students. Participating states (Colorado, Connecticut, Delaware, Kentucky, Maine, Michigan, New Hampshire, Ohio, Oklahoma, Oregon, Rhode Island, and Vermont) committed to policy and implementation changes around graduation requirements, assessments, and accountability. Currently, more than 30 states have policies that allow CBP, although these policies do not always translate into broad use by districts and schools, where traditional definitions of credit as seat time prevail in local policy and practice. In most cases, providing flexibility has only led to pockets of innovation. For CBP to advance, states may need to do more than just allow districts and schools to use competency-based approaches for graduation and credit accumulation/advancement. 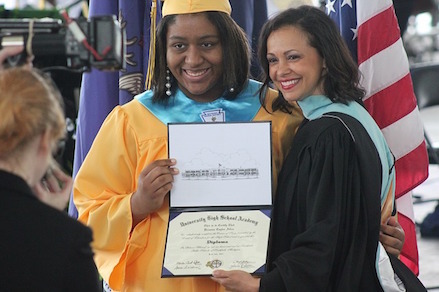 Achieve has developed recommendations with and for states as they consider adopting policies to require, incentivize, or encourage districts to use competency-based graduation requirements that tie the high school diploma to students’ demonstrated learning of college- and career-ready standards. In a competency-based system, summative assessments play a critical role in validating determinations of student proficiency/mastery of standards for graduation or credit and in advancing students through the standards throughout their K–12 course of study. The assessments will be an important piece of the state’s strategy for establishing comparability or moderating results across districts, schools, and educators to ensure consistency of high expectations for all students. Achieve encourages states to work towards a high quality assessment system that is aligned, coherent, and streamlined. Students should not be taking assessments that do not provide meaningful learning experiences in their own right; do not provide valuable information to them, their families, and their educators; or that in any way contribute to an environment of over-testing. Achieve has offered guidance to state leaders on determining how to utilize aligned assessments in CBP systems. State accountability for districts and schools is a key leverage point for states in emphasizing a level of proficiency that equates to college and career readiness. Achieve encourages states to consider how accountability and public reporting systems can provide critical data to identify needs for support and intervention in order to drive student progress toward and beyond this level in a way that is supportive and aligned to CBP. Achieve has offered guidance to state leaders on how these systems can provide signals to ensure quality; improve the rates of students mastering standards; and most importantly, reduce disparities in mastery of standards among students by race, ethnicity, gender, family income, special education status, and English language learner status. Assessment is meaningful and a positive learning experience for students. Students receive rapid, differentiated support based on their individual learning needs. Learning outcomes emphasize competencies that include application and creation of knowledge. The process of reaching learning outcomes encourages students to develop skills and dispositions important for success in college, careers and citizenship. 1 Patrick, S. & Sturgis, C. (July 2011). Cracking the Code: Synchronizing Policy and Practice to Support Personalized Learning. iNACOL.